Attendees listen during the Rio Grande Valley Builders Association forum for the Hidalgo County Judge's seat at The McAllen Country Club Wednesday Jan.10,2018, in McAllen. McALLEN — Candidates vying for the Hidalgo County Judge’s seat took time outlining their platforms during their first forum here Wednesday afternoon. Editor’s Note: This story has been edited to clarify candidate Richard Cortez’s remarks. 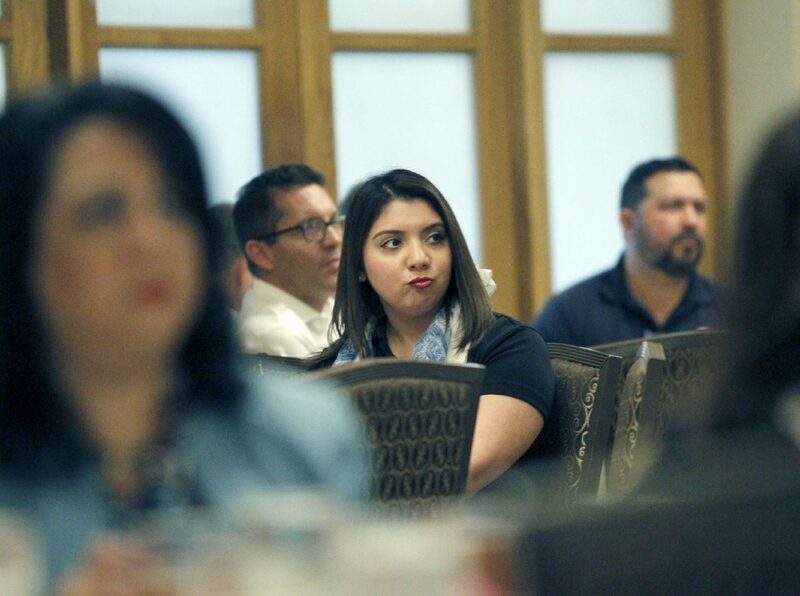 The Rio Grande Valley Builders Association hosted the forum at the McAllen Country Club as part of its monthly meeting for its members, so the event was not open to the public. Candidates Jane Cross, Richard Cortez, and Eloy Pulido meet and greet before the start of the Rio Grande Builders Association forum for the Hidalgo County Judge's race at The McAllen Country Club on Wednesday Jan. 10, 2018, in McAllen. Democratic candidates Richard Cortez and Eloy Pulido, along with Republican candidate Jane Cross, were invited to lay out their platforms before the group of more than 100 builders and developers. Candidates were given two minutes to make opening remarks and then took turns answering a handful of questions that members submitted to the association prior to Wednesday’s event. The questions ranged from the usual hot-button issues, including the construction of a new county courthouse and the creation of a new taxing entity, to ones more technical in nature, such as regulations for sidewalks and inclusionary zoning for affordable housing. Pulido, a former Hidalgo County judge, used his opening remarks to compare the present administration to his own, which ran from 1999 to 2002. Throughout the forum, Pulido used his time to criticize current County Judge Ramon Garcia, who was sitting in the audience. Cross urged those in attendance to elect a candidate who can bring creative solutions to the table. All said they were against raising taxes. Asked if he would support creation of a tax entity to fund the University of Texas Rio Grande Valley medical school, Cortez said no, that it would not solve the problem, and spoke generally about needing innovative solutions. Pulido suggested charging an extra dollar for anyone booking a hotel or a motel room in Hidalgo County. “Let those people that come to Hidalgo County from Mexico … from up north … be levied one additional dollar,” he said. Cross, on the other hand, was abrupt with her response. “First of all, I thought the state was supposed to fund the medical school,” she said before returning to her seat. Then came the much-anticipated question about the new courthouse. Cross said the county’s proposal “did not pass the smell test.” but conceded that it needs an upgrade. So she posed two suggestions. If the courthouse is crowded and more courtrooms are needed, why not have judges work split shifts, she asked. Pulido also mentioned a failure to pass “a smell test” during his response about the courthouse, saying the price was too high. He estimated each square foot would cost the county $446. Pulido would not vacate the old courthouse either, and would be willing to make repairs. Cortez said he hadn’t performed an objective analysis to help answer whether the courthouse is necessary, but trusts the professionals who have done so. “When you give me the job, then it’s going to be my job,” he said. 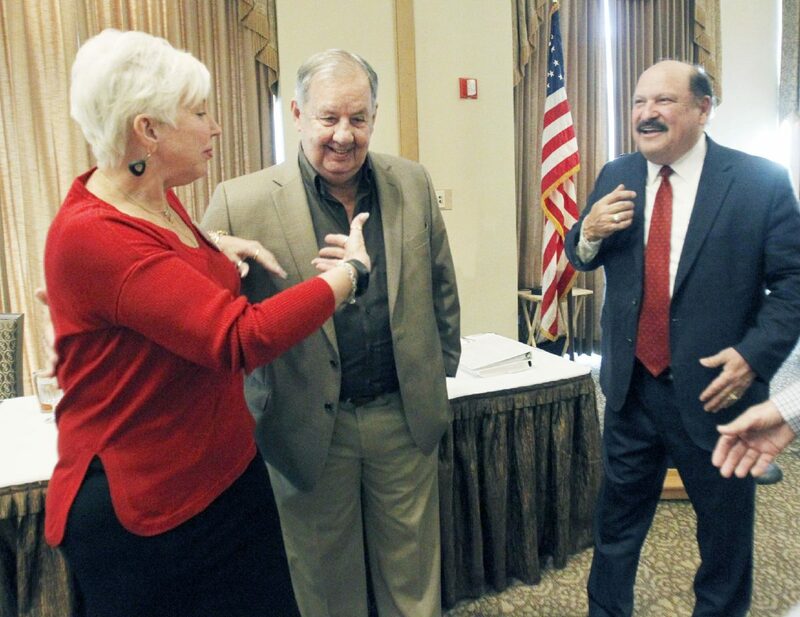 The former McAllen commissioner, however, emphasized the county needs to work with the city of Edinburg. This is perhaps the only thing both Democratic candidates agreed on. Pulido also said the county should not hold the county seat “hostage” over Edinburg city leaders as they mull a $30 million contribution to the courthouse project. “The $30 million that Ramon (Garcia) wants to charge the city of Edinburg, I totally disagree with,” Pulido said. Both he and Cortez will face off in March, while the Democratic primary winner will face Cross in November. “You don’t have to worry about voting for me in March, but please think of me in November,” she said.